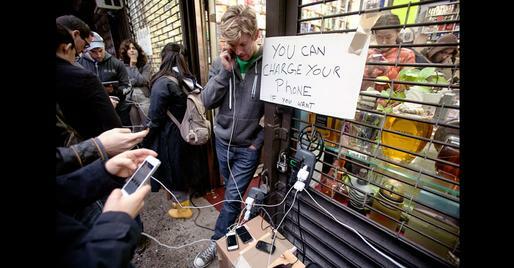 Cell phones are invaluable during a power outage. It brings up the tired old question, “what did we do before cell phones?” Well, we connected with friends and family using corded, landline phones that still work during a blackout, but those have been disappearing from homes in favor of our handy smart phones. A cell phone can connect you to a larger community of people, like friends on Facebook as well as news outlets. The biggest disadvantage of these devices, by far, is their limited battery life. Below are some tips and tricks to help you get the most mileage out of your cellular battery during the next power outage. Cell phones are constantly sending and receiving cellular and wi-fi signals in order to keep you connected. Putting your phone on “airplane mode” disables this process. This will extend the life of your battery tremendously but will keep you from being able to use any apps that require a network as well as making or receiving calls and text messages. “Airplane Mode” disables all wireless communication including cellular. If you’d rather stay connected to your cellular network but still want to conserve some power, this is a good start. Since your wireless modem is likely without electricity anyway it’s a no-brainer to turn wi-fi off. And, you can probably live without any Bluetooth activity during a blackout. If you have/had time to fully charge your laptop(s) you can plug your phone directly into its USB port to draw enough power for a top-off. This is a short term solution as this method of charging can take some time and obviously drains the battery of the laptop. There are several free apps developed to help preserve your phone’s battery like Easy Battery Saver for Android devices and Battery Doctor for your iPhone. You may have some apps running quietly in the background that are also putting more demand on your phone’s battery. If you’re not using them, shut ‘em down. Find instructions on how to do this for your Apple device HERE or Android device HERE. Extend your phone’s battery life by reducing the brightness of its display in your phone’s settings. Texting is a far more efficient way of communicating during a blackout. Messaging requires a much shorter connection with your data network, thus less power is consumed. There are a variety of “juice packs” available ranging from $20 to $100+ made to charge devices via USB like your phone or tablet (some popular models are described HERE). These portable battery packs can give your mobile multiple full charges to get you though a short power outage of a day or two, or a weeks worth depending on how much you’re willing to shell for the charger. 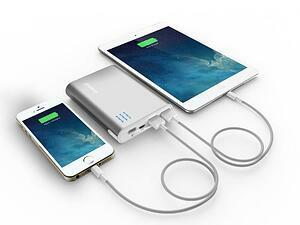 Similar to the external battery packs mentioned above, you can also charge your cell phone using AA batteries. You can make your own or buy a one. Since you probably planned ahead of the storm and stocked up on AA batteries this could be a simple and inexpensive option. Much like the devices above, a solar powered backup charger like the XTG Premium Solar Charger can juice your phone after charging from the wall or spending about 5 hours in the sun. It’s inexpensive and versatile, but the drawback is its reliance on clear skies and, you know, the sun, which might not be available during or after the storm. If you purchased a car within the last 5 years it probably has a USB charger. If not, make sure to pick up a car adapter for your particular cell phone model. Your car battery is way more powerful than that of your small phone, so you’ll likely get a full charge without having to turn on the engine. However, if you’re worried about draining the car battery you can start the engine to top it up. Just make sure you’re not in a garage or other enclosed area to prevent exposure to carbon monoxide. Power up your device with some good old-fashioned elbow grease. The WR-112 features a flashlight, AM/FM/NOAA radio, and smart phone charger and can be powered by USB, AC, DC, hand crank, or solar power! This is, by far, the most reliable and versatile option on this list. That is, if you don’t mind the reasonable amount of hand cranking required to generate power. 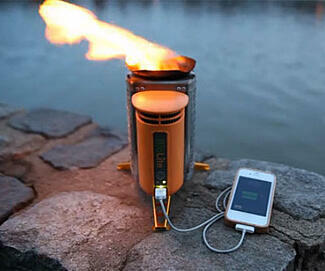 This nifty device is intended for campers and other adventure minded folk who have no source of power to draw from. It’s portable, lightweight and only requires a handful of sticks or twigs to light up. The BioLite generates a fire for cooking or heating up a cup of Joe and heat generated by the fire recharges an internal battery. Top off your cell phone, tablet or other device via its USB port. Keep in mind that having a fully charged phone is a great preparedness measure but is no guarantee that you'll be able to place calls through your network. Cell towers can become damaged, overloaded or powerless during a storm or emergency. If you'd like to learn more about being prepared for the next big storm, click HERE or you can click the button below to download our Light's Out Checklist.